Bits of cauliflower enveloped in a toasted coconut milk and cardamom sauce. 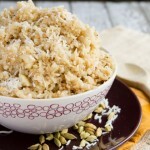 Coconut “rice” without the grains or starch. Break the cauliflower into florets. Using a cheese grater, grate the cauliflower. Or, if you have a food processor, add florets to the bowl of your food processor and pulse until cauliflower looks like rice. About 10-15 seconds of pulsing. Heat a large non-stick skillet over medium-high heat for 1-2 minutes. Add the coconut oil, melt, then add the onion. Saute until tender, about 5 minutes. Add the cardamom and stir with a wooden spoon until fragrant, about 30 seconds. Add the cauliflower and coconut milk, stirring to combine. Saute the cauliflower for about 10-12 minutes until the coconut milk is adsorbed. The consistency will be a little off for awhile, but it will come together as the cauliflower dries out a bit and brown specks begin to appear. Season with salt and pepper, serve! 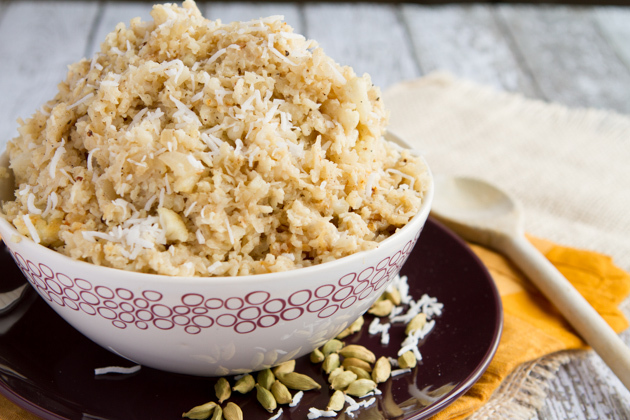 Coconut milk: you could use full-fat coconut milk in this recipe, I just chose not to.